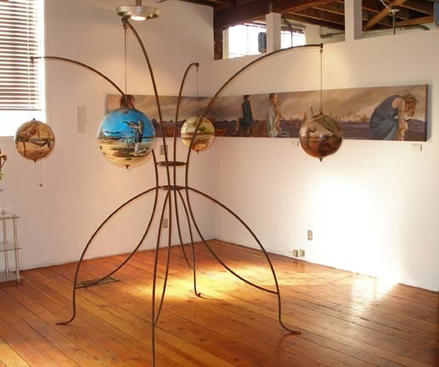 In the sleepy little town of San Fernando deep in the Valley that bears its name is a gallery–a serious art gallery that showcases not just art that sells, but art that captures the imagination and inspires. I am eternally grateful for the existence of La Galeria Gitana, directed and curated by Karen Nichols. You have to understand that galleries surviving in the San Fernando Valley are as rare as the California Condor, and this one has been in operation since 2008 though many people still don’t know about it. You should go. Although I missed the opening, I was able to catch the current exhibit, “From Surreal to Steampunk,” which will be showing through October 11. It’s serious fun. On the surreal side of the spectrum, the large-scale canvases by Pamela Mower-Conner stand out. Whatever you feel about representational art, you have to agree that this woman can wield a paintbrush. She works in acrylic, but her paintings capture all the subtlety of oil masterworks. My favorites by her are in a series called “The Malevolence of Chairs,” which depict Victorian-style chairs in post-apocalyptic landscapes. You’ll have to go to the show to see them because they aren’t on her website yet. Her spheres are also out of this world. On the steampunk end of the spectrum, Vincent Mattina and Ron Menashe take over with “repurposed ray guns” and bigger-than-life metal sculptures with all the gears and levers and belts you’d expect from 19th century industrial high-tech. The piece that stole my heart was a beautiful wood-carved sperm whale by Lawrence Garcia. The top of the whale opens up. Entombed inside the whale’s head is a man mid-scream pierced by a red lance. 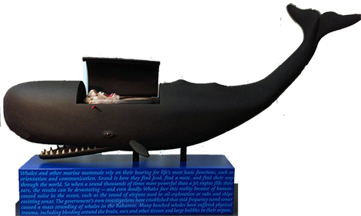 The whale rests on a base describing how whales are driven mad by the sonic booms of human industry. In contrast to the message, the sculpture is serene–as long as you keep the lid on. 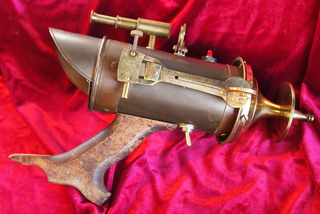 Ah…the contradictions of the mixed-up surreal steampunk world we live in.